Lexington, KY, January 19, 2015 –(PR.com)– When the Wildcats take the field next season, Commonwealth Stadium will be featuring a new UBU Sports synthetic turf system. The University of Kentucky has selected the UBU-Speed Series-S5-M, which was featured in the 2013 NFL Super Bowl at the Mercedes-Benz Superdome, the 2014 NFL Super Bowl at Met Life stadium, and is featured in the NFL Pro Bowl and NCAA BCS Sugar Bowl, annually. Considered Ground Gear for Athletes, UBU Sports surfacing systems are utilized by 10 NFL teams, numerous NCAA programs and many other athletic programs throughout North America. Work will begin in the spring of 2015. Lexington based Vescio’s SportsFields will lead the construction of the new UBU Sports surface, which will be installed by Kiefer USA. The team selected to successfully complete the stadium surface enhancement at Commonwealth Stadium for the University of Kentucky is eager to debut the UBU-Speed Series in the highly competitive Southeastern Conference. The University of Kentucky is a public, land grant university dedicated to improving people’s lives through excellence in education, research and creative work, service, and health care. As Kentucky’s flagship institution, the University plays a critical leadership role by promoting diversity, inclusion, economic development, and human well-being. Today, UK boasts a campus of some 30,000 students, 16 colleges ranging from the arts to medical fields, and more than 90 nationally ranked academic programs, as well as several prestigious intercollegiate athletics programs. Founded in 1977 and based in Lindenhurst, IL, Kiefer USA is an award-winning, athletic surface design and installation company. 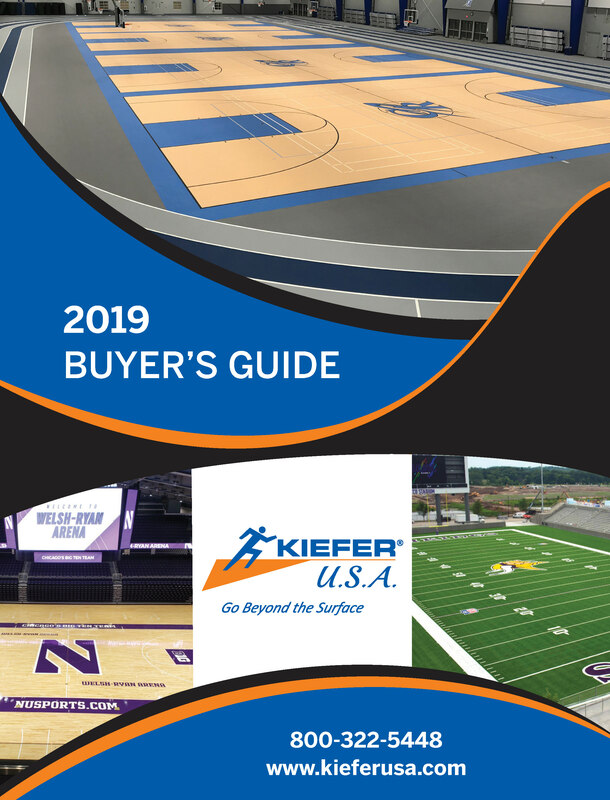 Kiefer USA’s long list of wood basketball court installations include the University of Kentucky, Ohio State University, University of Cincinnati, and Bowling Green State University. In addition to wood basketball surfaces, Kiefer USA also offers design and installation for track and field, multi-purpose facilities, artificial turf, weight rooms, locker rooms, and fitness facilities. The Ewing Fieldhouse completed installing Mondo Sportflex M in the middle of February. With this remodeling comes the promise of more energy efficiency and a saving in costs for the main campus. University of Central Missouri, the 2015 Women’s Division II, Indoor Track & Field National Champions, have chosen Mondo Super X for the renovation of the Multipurpose Building. The renovation for the Multipurpose building will be starting in July. Stay tuned.